When I told Stanley Chi that my blog won as one of the Top Ten Emerging Influential Blogs of 2013, he immediately accepted my request for a congratulatory video. I told him I would like to use the video on my Thank You speech during the recognition at the 2nd Digital Influencers Marketing Summit. But due to "avoidable" circumstances, the time allotted for the presentation of winners got cut short to a few minutes of speech. We were told we can just share the history of our blogs via a webinar that will be scheduled on Sunday, September 29 at around 5 pm. Well, I actually already posted Stanley Chi's congratulatory message at the Wazzup Pilipinas Fan Page, but I decided to create a dedicated blog so that more people would see the videos. Why? Because the guy painstakingly made three versions of the congratulatory video for me. At one corner of National Bookstore, away from the noise of the RJ Ledesma book launch, we recorded these videos hoping that it will not be too noisy in the background. I actually suggested we record the video inside a restroom so that it would be quiet enough. He said that sounds scary! Hahaha!! I just realized it would be awfully strange to do a video shoot inside the men's room!! Lol! He was even the one who volunteered we repeat the video shoot when he was not satisfied with the first one, and then the next one. I'm getting free endorsement from a celebrity who is somewhat a perfectionist in his work! I mentioned that one of my blogger friends received a copy of his book, and that I saw that my friend had an article contribution in his book. I was at my friend's office cubicle when the book arrived from delivery. My friend quickly took a photo of it, as well as a glimpse of his article, and hurriedly posted it on Facebook. I have another friend who said that he also made a contribution to one of Stanley Chi's earlier books. It seems almost everyone I know has a literary masterpiece in his book except for me. Stanley Chi was also so humble during RJ Ledesma's "Playing with Pink Parts" book launch at National Bookstore Glorietta 1 branch in Makati. He kept on saying he is not as famous as RJ Ledesma, or the other humor book writers like Ramon Bautista or Tado Jimenez. He even told me that the guard at National Bookstore didn't recognized him. He was saying that the audience at the Digital Influencers Marketing Summit may also not know him. However, I convinced him that there sure to be people that would recognize him at the event and I will be honored to have him congratulating me in the video for all the summit attendees to see. Damn the lack of time! So I am making it up by making this dedicated blog for him. The guy tries to be funny in the video so it would be a waste not to show them. Lol! He mentioned that he will be launching his own book soon sometime December and that he will personally invite me to attend that event as well. I can't wait for December! Incidentally, he tagged me in Facebook (Yes! He's my friend in FB) an image of the Panatang Makapogi as seen below. 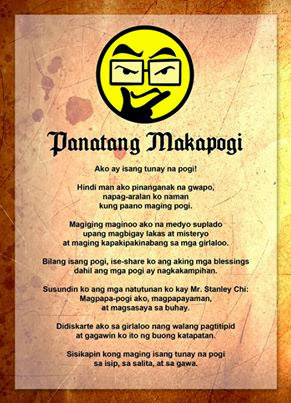 Get to sample his kind of humor by reading the work of a "tunay na pogi". Rest assured that I will follow his Panatang Makabayan "na maging isang tunay na pogi...sa isip, sa salita, at sa gawa." Thank you to Stanley Chi for the videos and hoping to bump into you again sooner even before your December book launch!